The flower buds or the flower of initial blooming of Lonicera japonica Thund. , L. hypoglaucA Miq., L. confusa DC., or L. dasystyla Rehd. of family Caprifoliaceae. All over in China, mainly in Henan and Shandong provinces, etc. Collected before it blossoms in earlier summer. Fragrant smell, bland and slightly bitter. At the initial blossoming stage, complete flower, white-yellowish in color and big in shape. Dried in shade after collection, unprocessed or made into distillate for use. Pungent, slightly bitter, cold; lung, heart, stomach and large intestine meridians entered. Clear heat and remove toxicity, disperse wind-heat, clear summer-heat. Because it excels in clearing heat and relieving epidemic toxicity, it is indicated for any stage of warm diseases. For initial warm disease marked by pathogen staying in defense system, it can disperse wind-heat so as to exteriorly expel pathogens out from lung and defense system. 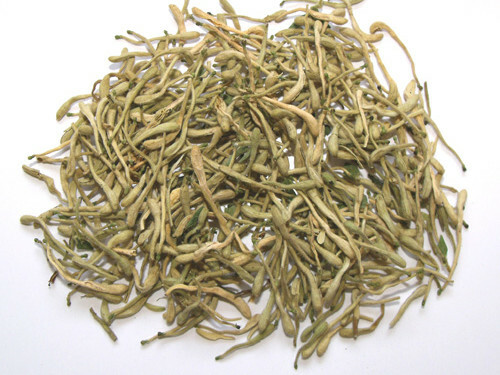 Additionally, it can clear heat and epidemic toxicity, Therefore, it is commonly used in clinic and often combined with wind-heat-dispersing herbs, such as Jing Jie, Bo He and Niu Bang Zi, as in Yin Qiao San from Wen Bing Tiao Bian which is also commonly indicated for exterior syndrome of external contraction of wind-heat. For warm diseases in the stage of heat entering qi system or deeply entering nutrient and blood systems, it has the actions of clearing heat and removing toxicity, and combined actions of clearing heat, purging fire and cooling blood as well. For excess heat of qi system characterized by high fever, polydipsia, and full and large pulse, it is combined with herbs good at clearing heat and purging fire, for example, Shi Gao and Zhi Mu as in Yin Qiao Bai Hu Tang. For heat entering nutrient and blood systems manifested as high fever, coma, macular eruption, hematemesis and epistaxis, it is often combined with erbs specialized in clearing heat and cooling blood, such as Sheng Di Huang and Xuan Shen in Shen Xi Dan from Wen Re Jing Wei (Compendium on Epidemic Febrile Diseases) and Qing Ying Tang from Wen Bing Tiao Bian. Because of the actions of clearing heat and removing toxicity, it can also take effects of curing abscess, relieving sore throat and checking dysentery. It is regarded as the essential herb for treating sores and abscess due to heat-toxicity and swollen and sore throat because it is scarcely harmful to stomach though it's cold in nature. It can also be used in checking diarrhea and dysentery due to heat-toxicity. For sores and abscess marked by red swelling and burning pain, it works when being used singly for oral or topical administration. For example, it is used singly in Shan Tang Jing Yan Fang to treat all kinds of swelling and toxicity no matter whether the pus is formed and discharged or not, its decoction is taken orally while the gruffs is applied topically. 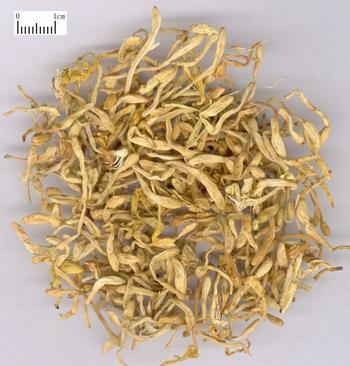 The effects are much better when being used with other heat-clearing and toxicity-removing herbs or blood-activating and nodulation-dissipating herbs, as in Yin Hua Jie Du Tang from Yang Ke Xin De Ji, it is combined with Lian Qiao, Zi Hua Di Ding and Huang Lian, and in Wu Wei Xiao Du Yin from Yi Zong Jin Jian, it is combined with Ye Ju Hua, Zi Hua Di Ding and Pu Gong Ying. For intestinal abscess with abdominal pain, it is often combined with herbs which excel in removing toxicity and cooling blood, activating blood and dissipating nodulation, clearing heat and discharging pus, for example, Da Huang, Mu Dan Pi and Yi Yi Ren, etc. , as in Qing Chang Yin from Bian Zheng Lu (Records of Syndrome Differentiation). For mammary abscess with swelling pain, it is often combined with toxicity-removing and ab-scess-curing herbs,and blood-activating and nodulation-dissipating herbs which mainly enter lung and stomach meridians, such as Pu Gong Ying and Gua Lou in Xiao Ru Tang from Yi Xue Zhong Zhong Can Xi Lu. For swollen and sore throat, it can be used in condition of either interior excessive heat-toxicity or invasion of wind-heat. It is often combined with toxicity-removing and sore throat-alleviating herbs such as She Gan and Ma Bo when treating the former condition, as in Yin Qiao Ma Bo San from Wen Bing Tiao Bian; while it is often combined with wind-heat-dispersing herbs and sore-throat-alleviating herbs such as Bo He and Niu Bang Zi when treating the latter condition. For dysentery due to heat-toxin, it can be decocted singly and raken frequently, as in Ren Dong San from Hui Zhi Tang Jing Yan Fang (Experiential Prescriptions from Hui Zhi Clinic).and can also be combined with herbs such as Huang Lian and Bai Tou Weng which excel in clearing heat and drying dampness, and removing toxicity and checking dysentery so as to reinforce its effects. In addition, the Jin Yin Hua Lu made by means of distillation can dispel summer-heat, and is mainly indicated for polydipsia due to summer-heat; it can also be used with He Ye, Xi Gua Cui Yi and Bian Dou Hua, as in Qing Luo Yin from Wen Re Jing Wei. Decoct 15～30g. The raw product is good at dispersing wind-heat and clearing interior heat; Jin Yin Hua Lu is often used to treat polydipsia due to summer-heat, 60～120ml for each time which is equal t0 3. 5~7g of raw Jin Yin Hua. Proper dosage is for topical administration.